The miniature of Jerome of Prague at the stake has intrigued me greatly (see Episode 11). 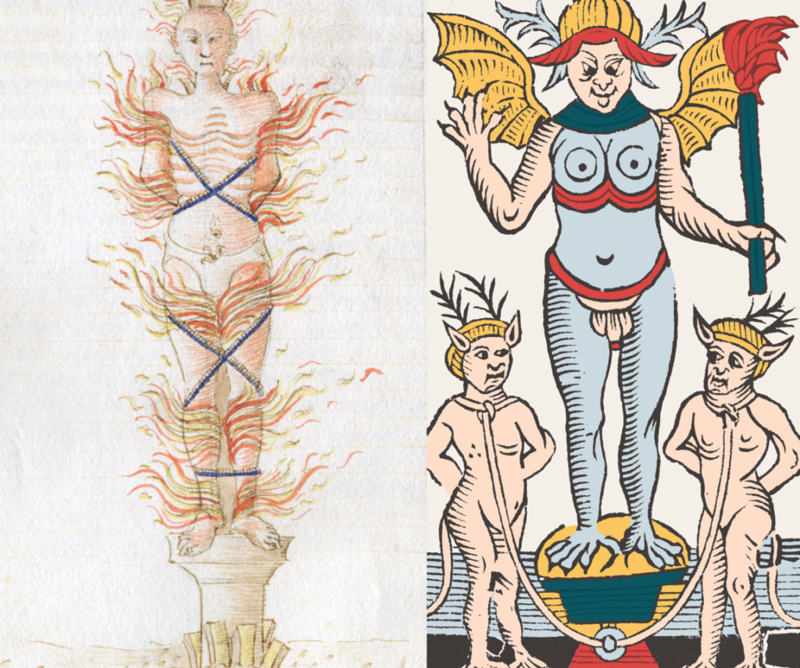 There was something very personal in the design, a distinctive style that I recognized in the Devil card, even if the two images were quite different. Style is a signature. I had to investigate the artist’s background. Felice Feliciano, codex 314, from the library of the Museo Correr in Venice, folio 6 recto. Copied and illuminated by me, Felice Feliciano from Verona, in my name and by my own initiative, in the year of Christ 1460, month of February. So who was this Felice Feliciano? The man was born in Verona in 1433, the same year as Marsilio Ficino, to a poor family. He was an original personality, not fitting into any category. It seems his first profession was that of scriptor, or scribe: he copied manuscripts for his clients, but also, as in the case of the manuscript containing the miniature of Jerome of Prague at the stake, for his personal use. During his life, he practiced most of the arts of the book: miniaturist, bookbinder, typographer, and wood carver. At a young age, he developed an interest in archaeology. With a group of friends, he went in search of the vestiges of Roman Antiquity. He made drawings of his discoveries and copied Latin inscriptions engraved on monuments, a practice that led him to studying the characters of Latin writing. Taking inspiration from Roman capital letters, he created an alphabet based on geometric principles. Feliciano was restless, however. Because of his idiosyncratic way of living, he had to flee his gossipy hometown. He spent time in almost all of the great cities of northern and central Italy, including Ferrara, Venice, Rome, Bologna, and Padua. He also traveled to Germany, Hungary and (likely) Spain. He led a wandering life, offering his skills to various patrons. Throughout his travels, he made friends with artists, including the famous painter Andrea Mantegna. He also dedicated himself to poetry and wrote a novel of courtly inspiration, as well as letters, which he compiled into collections. For many years, he practiced alchemy, a deceitful experience whose disappointments he wrote about with humor in his letters. The date and place of his death never have been confirmed. It has been surmised by some that he died during an epidemic of plague near Rome in 1479. This fascinating, multifaceted character possessed all of the skills required to competently produce a tarot deck, from the conception of the figures and the calligraphy of the titles, to the carving of the molds and their impressions. Could it be that he collaborated with the Medici and Ficino on the production of the Tarot of Marseille? There is no evidence of it, but Feliciano’s presence in Florence was documented on two occasions, precisely during the years when the Tarot of Marseille was created. He signs one of his letters from Florence in July 1465. In another one, he tells his correspondent how he had witnessed, in Florence, the departure of a group of horsemen sent as emissaries to the pope in Rome, which dated his presence in the Tuscan capital to September 1472. These documents do not indicate what Feliciano was doing there at that time. He may have just been passing by, but he also may have been there working on an important project. Nothing forbids one to imagine that he had been asked to collaborate on the making of the Tarot of Marseille. In that case, it should be possible to find in his works other traces of his influence on the design of the cards. Indeed, even without exhaustive research, certain circumstances allowed me to find several of them. Codex 314 of the library of the Museo Correr in Venice. See Giorgio Montecchi, Lo spazio del testo scritto nella pagina del Feliciano, in Agostino Contò and Leonardo Quaquarelli (eds. ), L’antiquario Felice Feliciano Veronese. 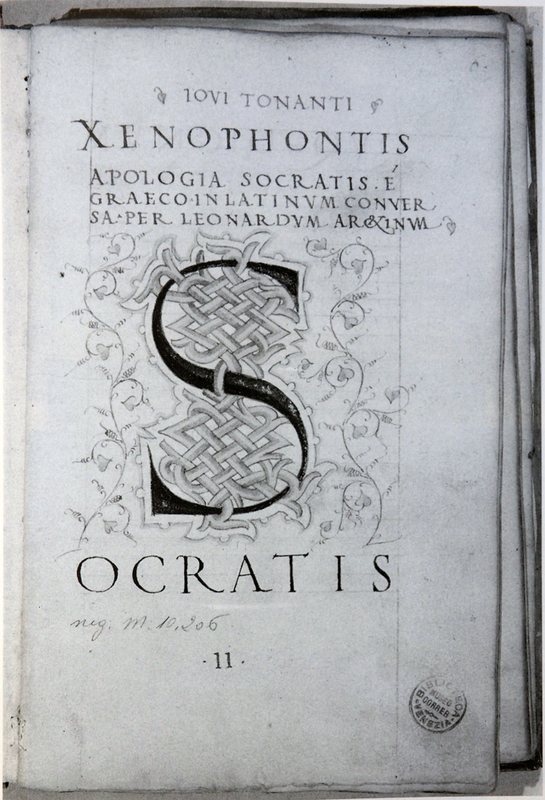 Tra epigrafia antica, letteratura e arti del libro, Padova, Antenore, 1995, p. 252-288. This is at least what the manuscript looked like in 1460. However, further additions were made later by Feliciano himself. See the study by Sergio Marinelli, L’amico del sublime, in Felice Feliciano, Epistole e versi agli amici artisti, Verona, Officina chimaerea, 1988, p. 19-23. Letter to Cristoforo di Geremia, in Felice Feliciano, Epistole e versi agli amici artisti, cit., p. 16. Manuscript Harley 5271 of the British Library, folio 114 verso.